We have a Keystone Cougar Xlite 26SAB 5th wheel. I decided to jump on the band wagon and replace the incandescent bulbs with LED’s. First I bought a couple of LED’s from Amazon someone had posted in a forum to see what they look like. 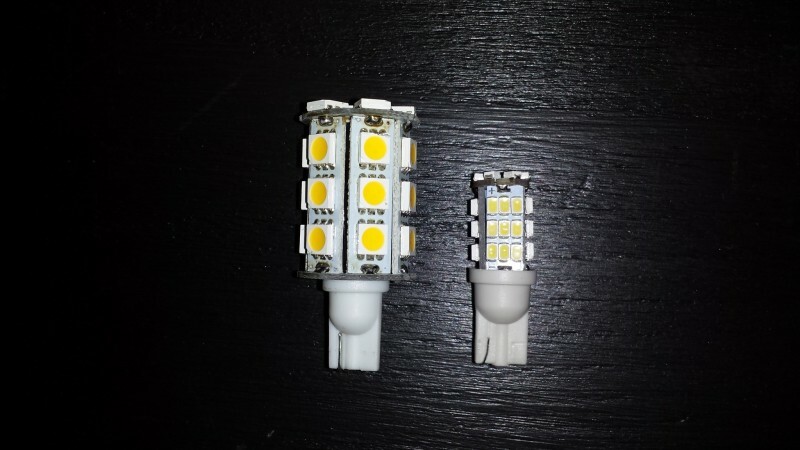 The description is 42-SMD T15 12V LED. The Amazon reviews include a number from RV’ers who’ve bought these bulbs and are happy with them. I found the color to be OK even though it was white but they weren’t as bright as the original 921 incandescent bulbs. 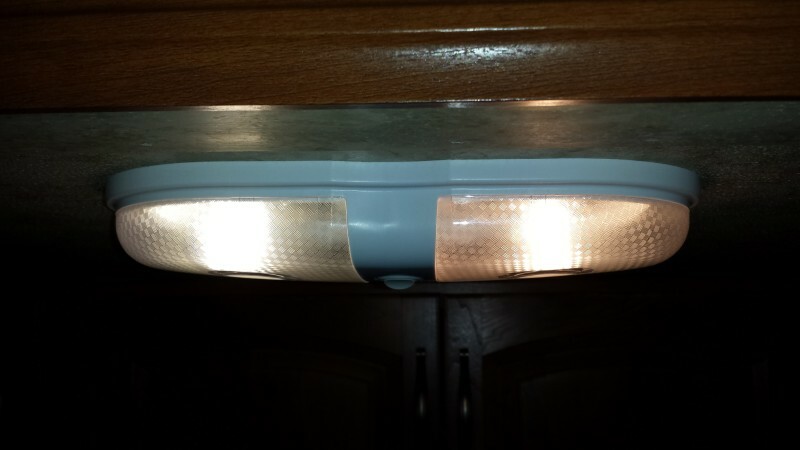 The first picture below shows the LED bulb on the left side of the fixture and the original incandescent bulb on the right. Next I searched on eBay to find a possible replacement. I ordered a 24-5050 SMD LED Super Bright DC12V, Warm White. It took about 2-1/2 weeks to arrive from China. This LED bulb is brighter than the bulb from Amazon even though it only has 24 LED’s compared to the 42 the other bulb has. The eBay ad said it was rated at 300 lumens. One source I found on the internet shows a 921 incandescent bulb has 264 lumens. The color is almost the same as the incandescent bulb. The second picture below shows the LED from eBay on the left side of the fixture and the original incandescent bulb on the right. 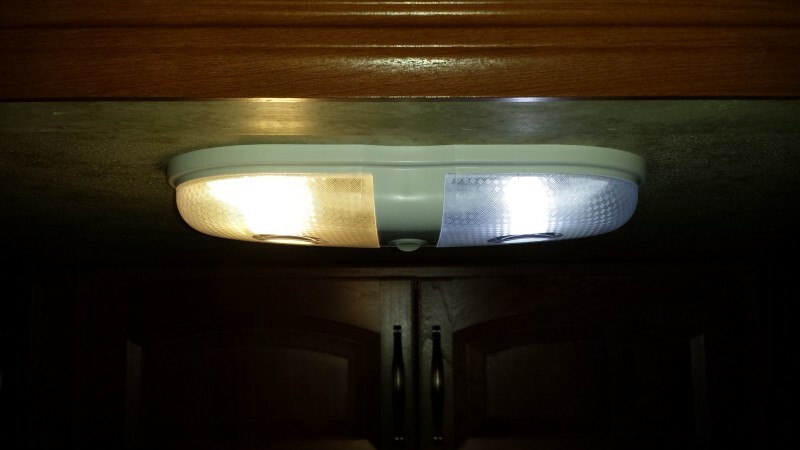 The third picture below shows the two LED bulbs. The one on the left is from eBay. I was a bit surprised how hot the LED bulbs got. I thought LED’s were supposed to run cool. I was a bit concerned with the heat, especially the LED from eBay. The large diameter of the bulb contacts the aluminum reflector of the fixture and didn’t want anything to melt! I used a non-contact infrared thermometer to take a few temperature readings. First I measured the temperature of the fixture lens for all three bulbs. Then I removed the lens and measured each bulb. Last I removed the bulb and measured the aluminum reflector in the fixture. As you can see, the large LED bulb is hotter than the smaller LED but both are much cooler than the incandescent bulb. The temperature of the lens and reflector for both LED’s are similar and much cooler than the incandescent bulb. Next I was curious about the current draw of the LED’s compared to the incandescent bulb. I ran the trailer from the battery for these measurements. First I measured the current with no lights, then with one incandescent, the Amazon LED, and the eBay LED. The LED bulb from eBay has almost three times the current draw as the LED bulb from Amazon but about a quarter of the current as the incandescent bulb. I prefer the brighter light from the eBay bulb so I’ve ordered enough to replace all the 921 incandescent bulbs in my trailer. 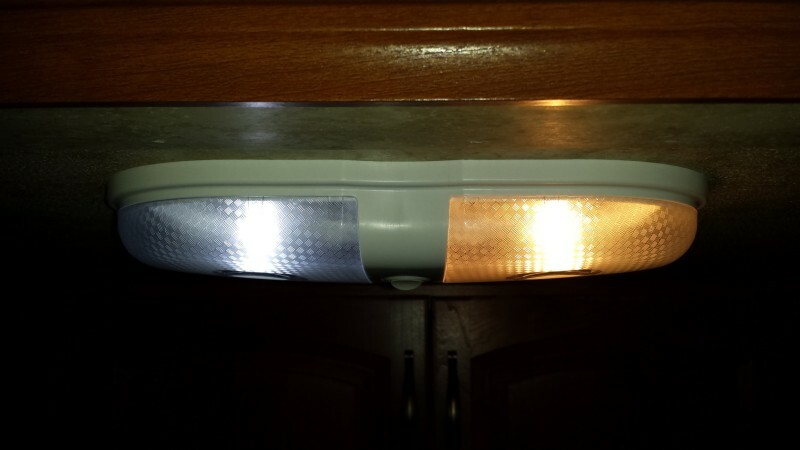 If you’re considering replacing the incandescent bulbs in your trailer with LED’s, first order a sample to see if you like the light. Don’t order 20+ LED’s based on someone’s forum post!